Is it really so ridiculous to suggest Corbyn is literally Hitler? THERE are many photographs of Nazi dictator Adolf Hitler. There are also many photographs of Jeremy Corbyn. But we never see them in the same room together. Why is this? 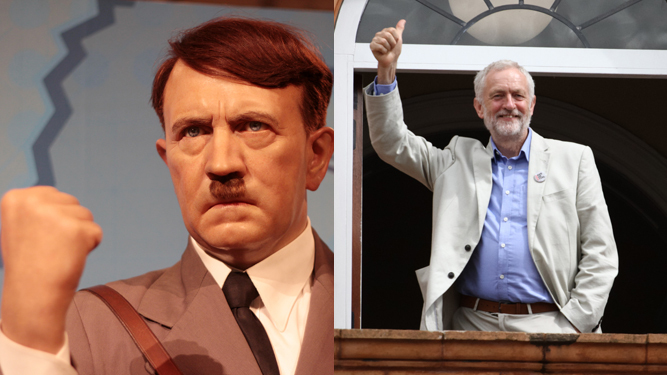 I put it to you that Hitler and Corbyn are the same person. They are both socialists. They are both fanatical anti-Semites with a fondness for hats. Perhaps most damning of all, they are both vegetarians. Hitler escaped the advancing Soviets in 1945 in a flying saucer and hid in a secret arctic base where he plotted to regain power taking over the Labour Party in 2015. But, you might say, wouldn’t Hitler be 129 years old and therefore dead? No. The Nazis were known for their experimental technology such as the robot suit worn by Hitler in the meticulously researched computer game Wolfenstein 3D. My belief is that Hitler’s head was grafted onto a robot body, and thus ‘Jeremy Corbyn’ was born, ready to slake his insatiable thirst for power by becoming MP for Islington North. As if further evidence were needed, just watch Herr Corbyn at a Momentum rally. The resemblance to the Fuhrer addressing the Hitler Youth is so obvious it barely needs pointing out. By now you are probably asking, is it time to destroy robot Hitler-Corbyn with a surgical RAF strike? Yes. And if we’re going to spend the money on pilots and plane fuel we probably should bomb Stonehenge while we’re at it, to annoy the powerful Pagan lobby and also deter foreign tourists. It’s what Churchill would have done. Are you completely zen or just utterly lacking in personality? 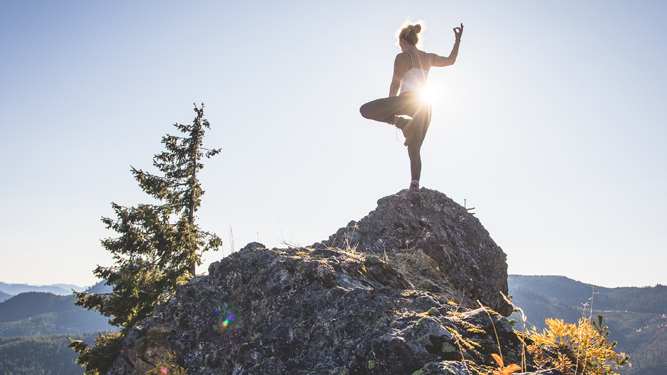 DO you exude mindfulness and wisdom or are you just a very dull person with flexible limbs? Take our test and find out. A) Listen in hushed, respectful silence as if you were the Buddha himself. B) Appear to be listening but are actually asleep with their eyes shut. A) Further along a spiritual path of transformation. B) Very self-absorbed but bendy. A) Helpful even though it upsets other people’s super-egos. B) Unhelpful but at least I’m keeping my gob shut. A) Represent a universal prayer rising to heaven. B) Cover up the smell of the dog. A) Jump at the chance to become more like you. B) Say they’ll think about it and then change their phone number. Mostly As: You are completely zen, but probably still very boring. Mostly Bs: You are just very boring.